Learning to eat better without sacrificing taste, variety & convenience. 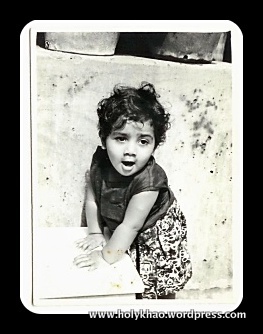 I am sharing a picture of me that was taken in the courtyard of my paternal grandparent’s home in Bangalore, India on the day I turned One . As you can see, I was a ‘healthy’ child 🙂 who grew up in the midst of indulgent grandparents, uncles, aunts, cousins and friends. My maternal grandmother could whip up an elaborate and delicious meal for guests in what seemed like no time, while also making tiny servings of whatever the children asked for to play house with the neighborhood kids. There was always something to celebrate, and feasts being served. As with any young mother, apparently my mom kept a watchful eye on what was going into my stomach. To this day, my aunt never fails to remind me of how much I used to love idlis as a little girl, of how my mom would give me 2-3 in a plate, and how I always asked another relative for an extra as soon as my mom left the room. Funny thing is that I’ve hardly made idlis over the last few years because in my opinion, it is a pain to soak, blend, ferment, get the measurements & temperature right, steam the batter, and then clean up and put away the dishes!. When I first tasted these at my friend Soumya’s house, it was love at first bite. The flavors of the dill, vegetables, cumin and chillies worked so well. 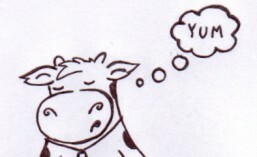 PLUS there was no fermenting! I have made these many times since getting the recipe and they are always a hit. In fact, I always make extra to freeze for another quick meal. [Cool them completely and freeze in double freezer safe bags. To reheat, thaw overnight in the refrigerator and microwave covered till hot.] By the way, Kai means coconut in Kannada. 1) Rinse the rice once or twice in cold running water and soak it for 2 hours in warm water. 2) Meanwhile, chop all these ingredients finely. 4) Blend the soaked rice into a coarse mixture using *****no more than 2.5 – 3 cups water total (including for masala above)*****. 5) Add the rice, masala & vegetables together with salt ( I used about 2 tsp) and mix well. The batter must be slightly thicker than plain idli batter. 6) Grease your idli plates and pour scant 1/4 cups into each indent. Press down lightly to shape. 7) Steam 14-15 minutes covered. 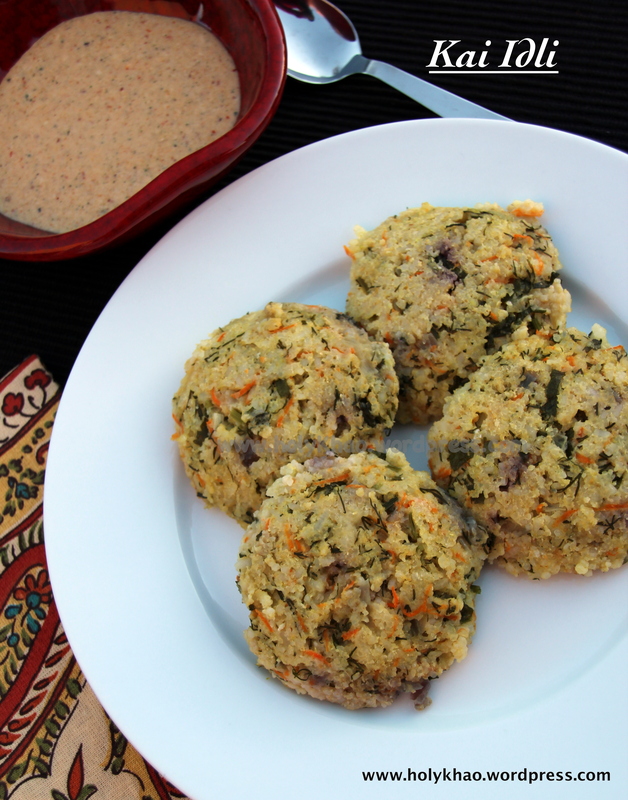 8) Serve with ghee & coconut chutney. While I was online, I found out that Feb 5, 2015 is World Nutella Day! 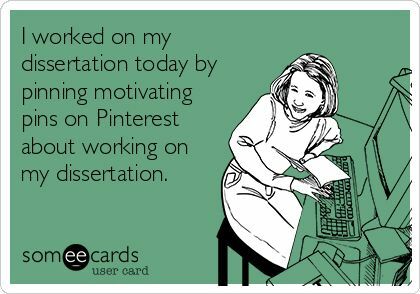 Of course, I had to go through the 700+ recipes to see what might inspire me, right? I’m mean, it’s Nutella!! 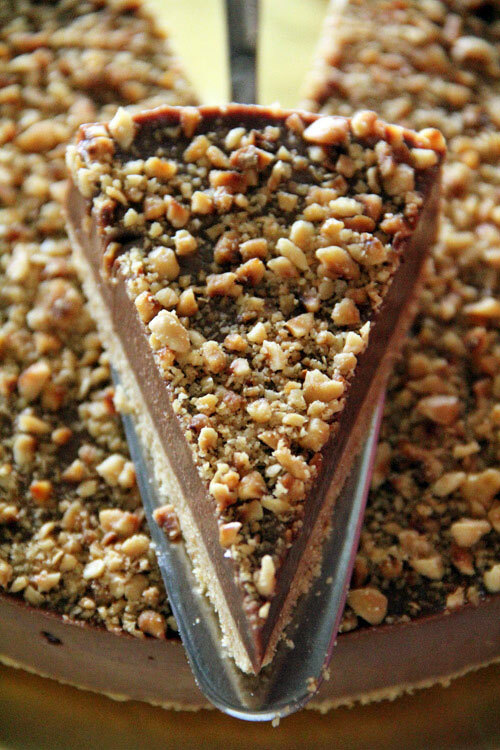 Look at this picture for No Bake Nutella Cheesecake. 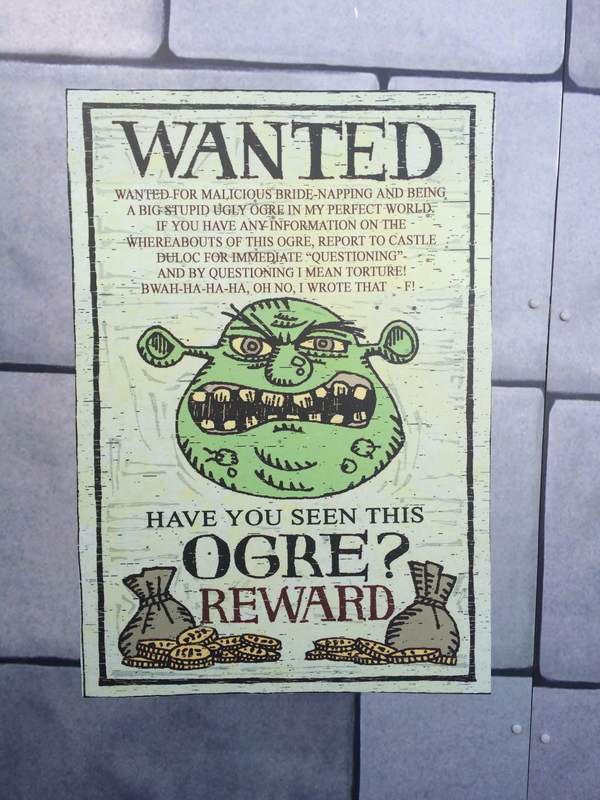 You know you want some. 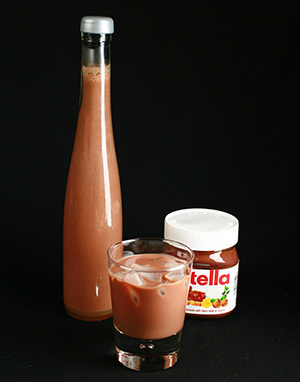 Or, how about some Creamy Nutella Liqueur. 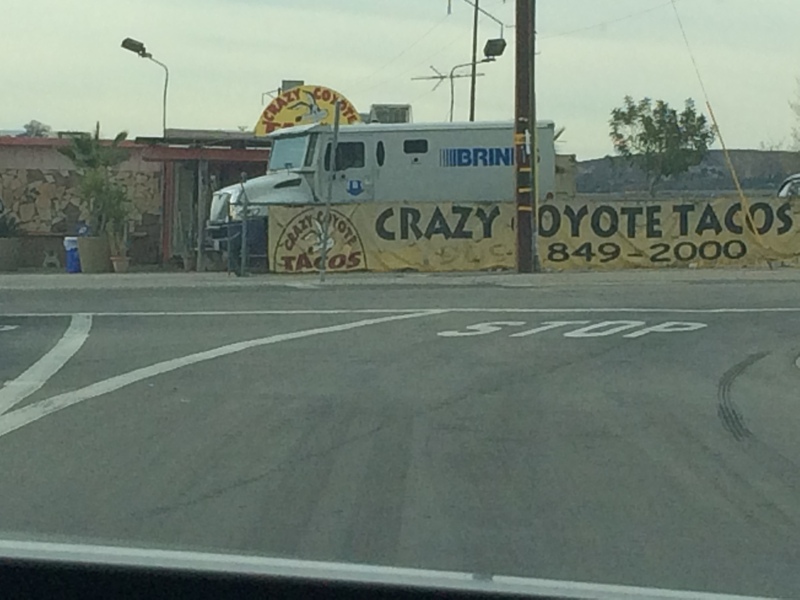 Sounds delish. 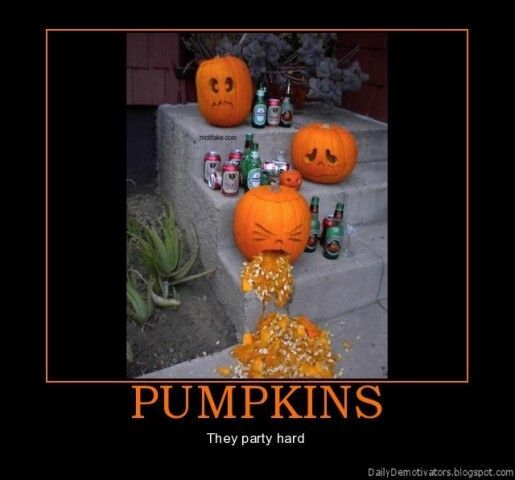 I’ll be making some for the next girls night :). The cheesecake & liqueur would be so amazing to share while chatting away with my high school classmates – we’ve been spending quite a bit of time over the last few days catching up on WhatsApp and it’s such a welcome sight to wake up to dozens of messages from friends waiting to be read. We’ve been reliving the simple pleasures of growing up in India in the 70s and 80s (there, now you all know what age group I’m in:)). Life has taken us in different directions – personal, professional & geographical – yet, it was easier to feel a connection with them after 20+ years than it is to make ‘new friends’ as we get older. We also travelled to the west coast over the holidays. While I’d been to LA several times before, it was my first trip to Scottsdale & Sedona, and I loved it!! The landscape is so unbelievably beautiful and unlike anything I had seen around DC. Though I’m not a beach person in the summer (I’ve been told I’m weird – many times! ), I enjoy walking on the sand in spring and fall. 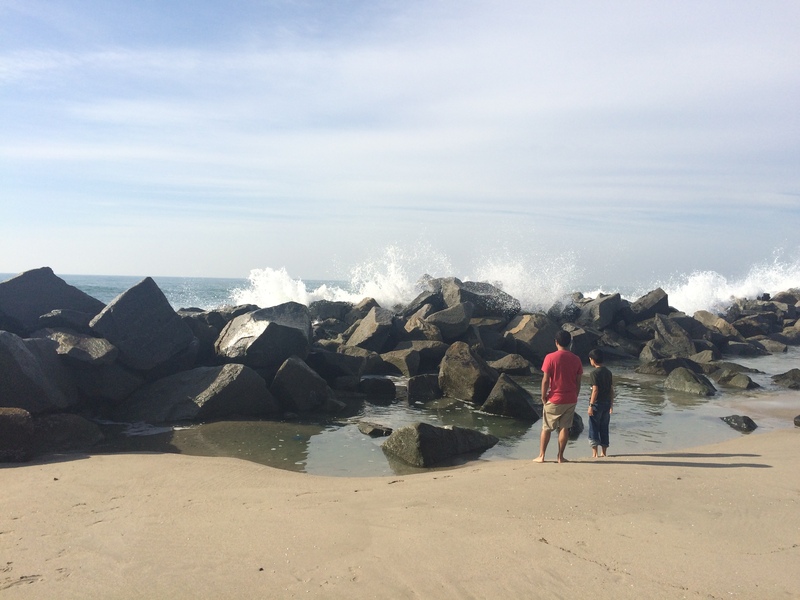 The cool ocean breeze, the sound of sea gulls and lighter crowds all make for a relaxing outing. 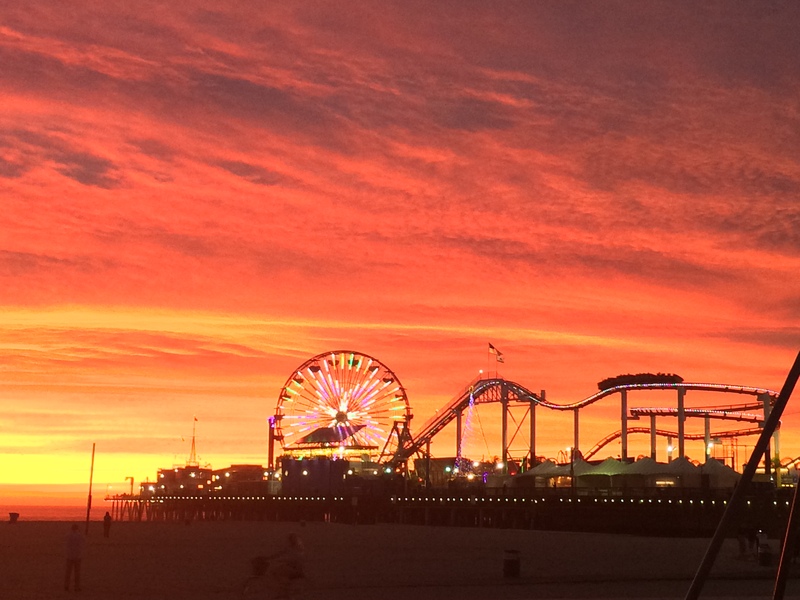 We biked to Santa Monica Pier for the rides, games and watching the sun set. 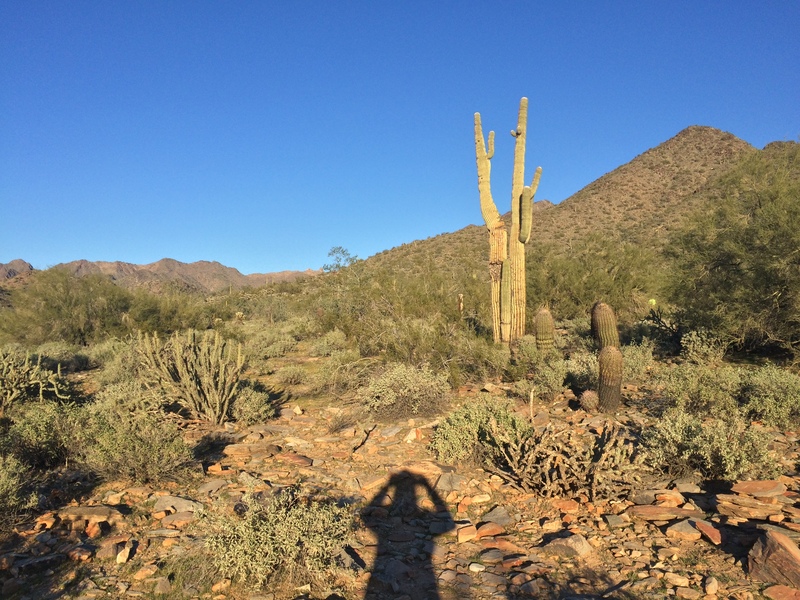 Besides Old Town, Scottsdale, we really enjoyed the scenic hike at McDowell Sonoran Preserve. These tall saguaro plants are exclusive to the Sonoran Desert of southern Arizona & western Mexico. It is the tallest cactus in all of USA, but grows at an excruciatingly slow pace of about an inch or two every 10 years. While they can grow up to 40-60 feet tall, interestingly, their roots are only a few inches deep long and are spread as wide as the plant is tall. About 1.6 million of these plants are in the Sonoran desert, and are truly a sight to see. 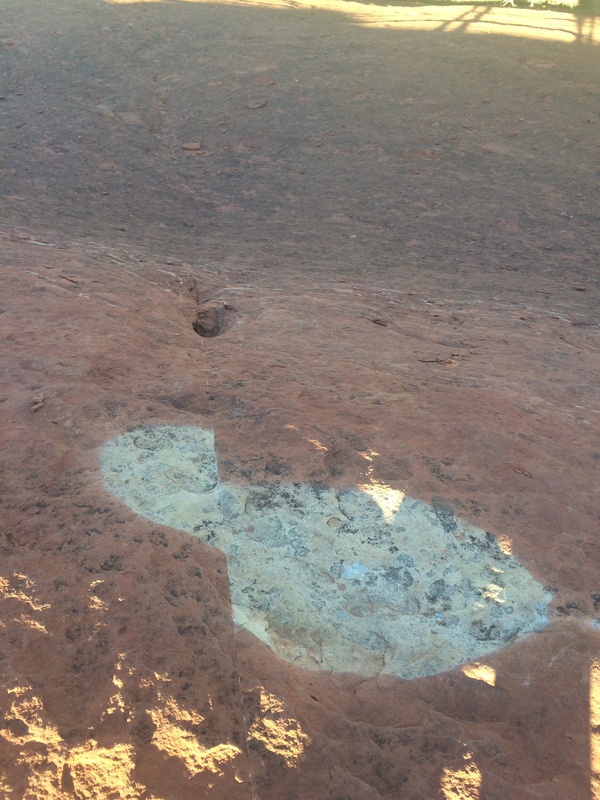 One of the coolest things of the trip to Sedona was taking the Broken Arrow Trail with Pink Jeep Tours. We rode with a professional guide/driver in an open pink Jeep Wrangler, and were taken off road to some spectacularly beautiful view points. The picture above shows an earthquake fault line (different versions state anywhere between 12-30 miles long), and I was amazed at how straight it was, although I’d never expected to see one in my life. It was supposedly so ‘small’ that it didn’t even have a name. Our guide called it “Nobody’s Fault” :)). We also got a chance to finally go up to the National Christmas Tree by the White House. The 2014 theme was Pathway of Peace. The tree was surrounded by 56 smaller trees representing every US state, territory & Washington, DC. Model trains chugged around at its base, and there was also a giant Menorah on the grounds. 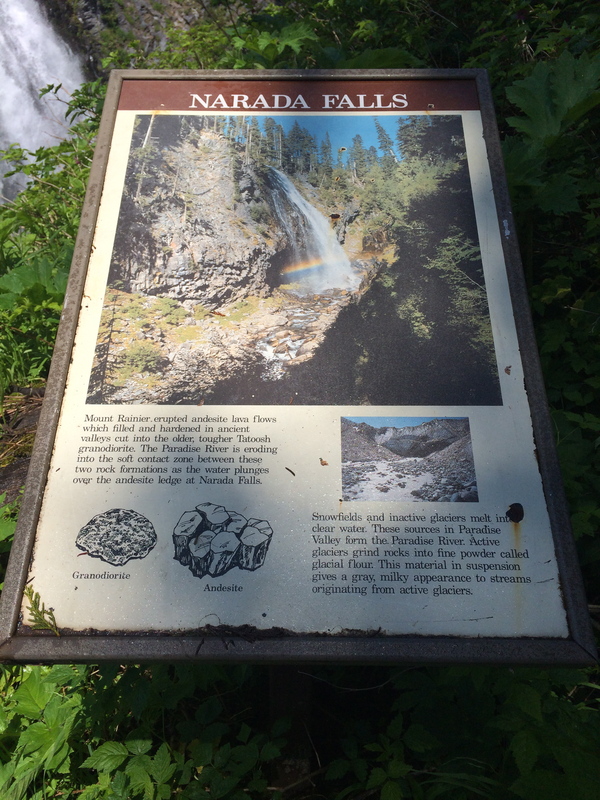 We had driven by on several other years, but this was my first visit on foot. Now that you know why I’ve been away, I hope you can excuse my absence 🙂 and walk along with me as I work my way through my recipe stash and share them with you in 2015. I have a lineup of interesting & international cuisine to share with you – salads, personalized Valentine’s Day cake, idlis that need no fermenting, easy entertaining recipes, and even low-carb healthy meals that I’ve been making each night for the last few weeks. Hope you all enjoy your weekend and have a fantastic 2015. Navratri or “nine-nights” festival is celebrated in India in late September-early October to honor the many reincarnations of Goddess Durga. In South India, prayers are also offered to Goddess Lakshmi (the goddess of wealth) and Goddess Saraswathi (the goddess of learning). 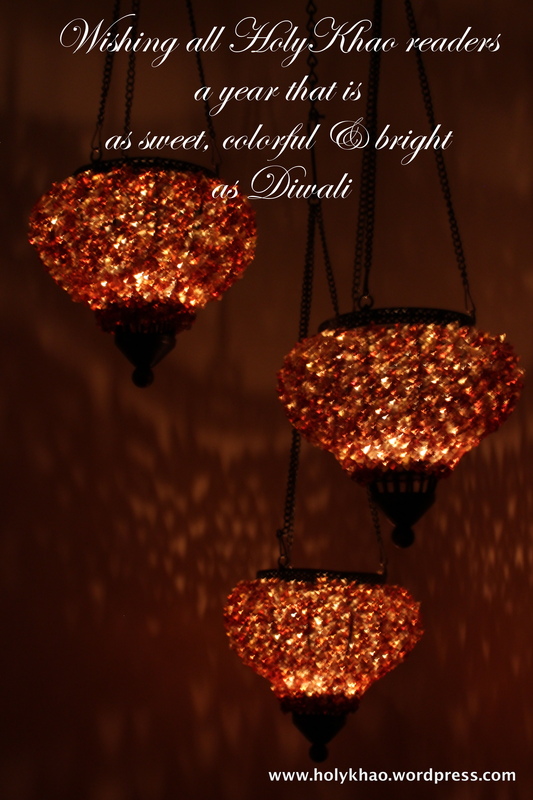 Symbolic of the victory of good over evil, it is celebrated differently across India. 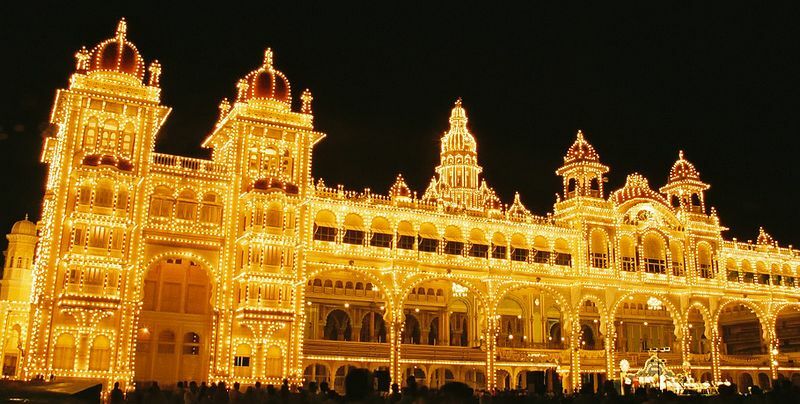 While the Durga Puja of West Bengal, and the Garba dance of Gujarat are very popular and well known, I wanted to share the details of the spectacular celebrations that go on in the southern city of Mysore, Karnataka. It is called DASARA in Kannada, the regional language. 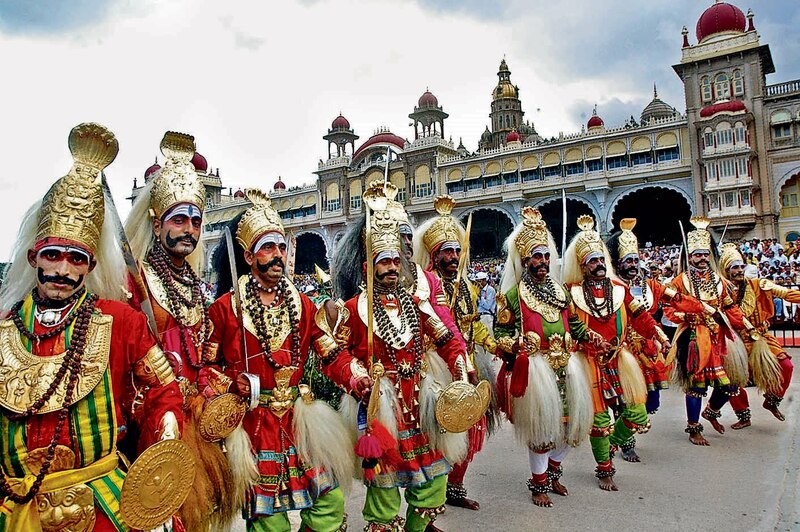 Originating in 1610 during the rule of the Wodeyar family, Karnataka will be celebrating Dasara for the 403rd year in 2014. Considered “Nada Habba” or state festival, Dasara (from sanskrit dosha-hara, meaning “defeat of ill-fate”) is also celebrated for nine days and culminates with Vijaya Dashmi “victorious 10th day”. 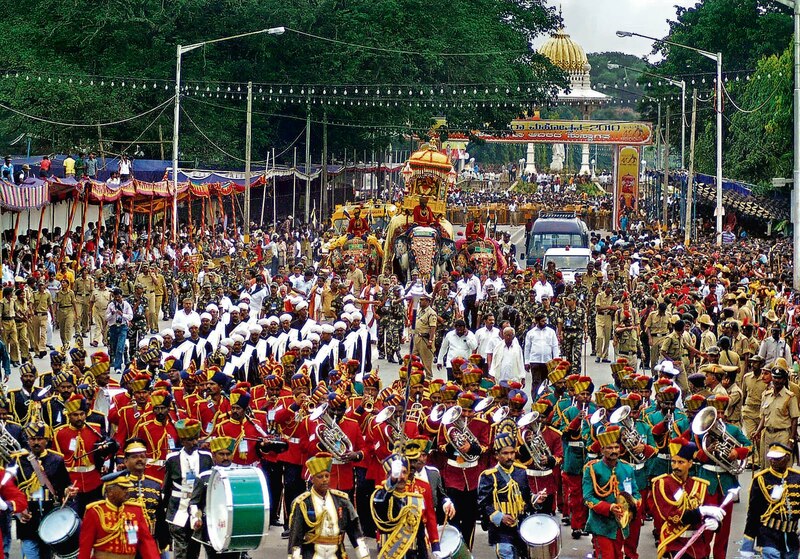 Parades, exhibitions, royal durbar (audience with the king), music, dance, wrestling, prayers, competitions and many more events mark this grand celebration in Mysore. 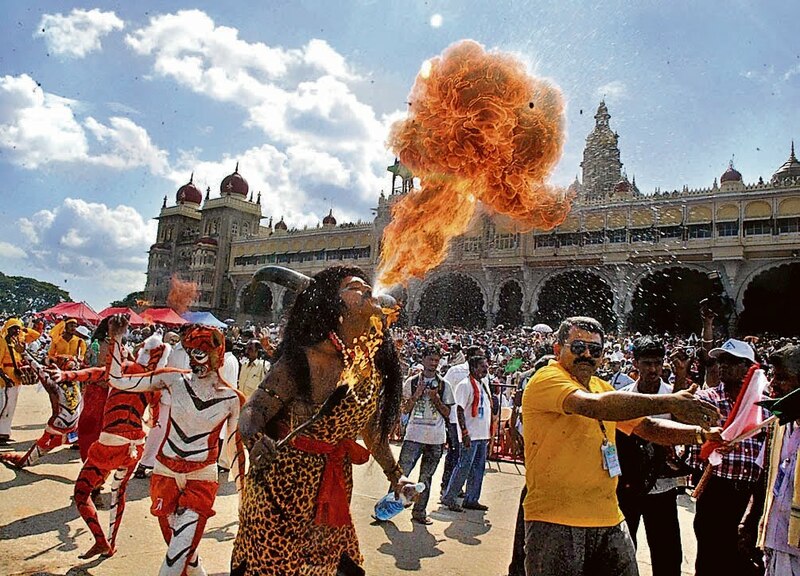 The word Mysore is derived from “Mahishur” or “Mahishasurana Ooru” – meaning ‘the town of Mahishasura’ in Kannada. Mahishasura was a half man-half buffalo demon who prayed to the Gods with such devotion that they allowed him to ask for a boon. When his request for immortality was turned down, he asked that no man would be able to kill him, and – betting that no women would be strong enough to defeat him – that if he had to die, it would be at the hands of a woman. The gods granted him his wish, and Mahishasura, thinking that he was unbeatable, began harassing the people of the world, and even the Gods. 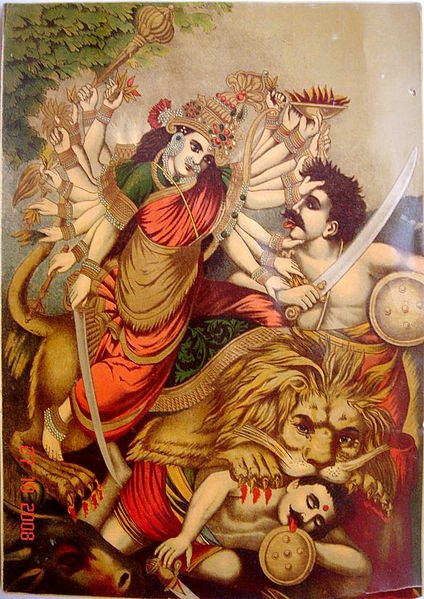 Finally, unable to tolerate this tyrant, Lords Brahma (the creator), Vishnu (the preserver) and Shiva (the destroyer), along with the other gods channeled their divine energy to create Chamundi (an incarnation of Durga) – a fearless and fiery fighter with thousand arms – each carrying the weapon of a different god, and riding a lion. After a brutal battle, the Goddess was finally able to slay Mahishasura on a hilltop, and good triumphed over evil. The people and the Gods then celebrated this victory for 10 days, calling it Dasara. 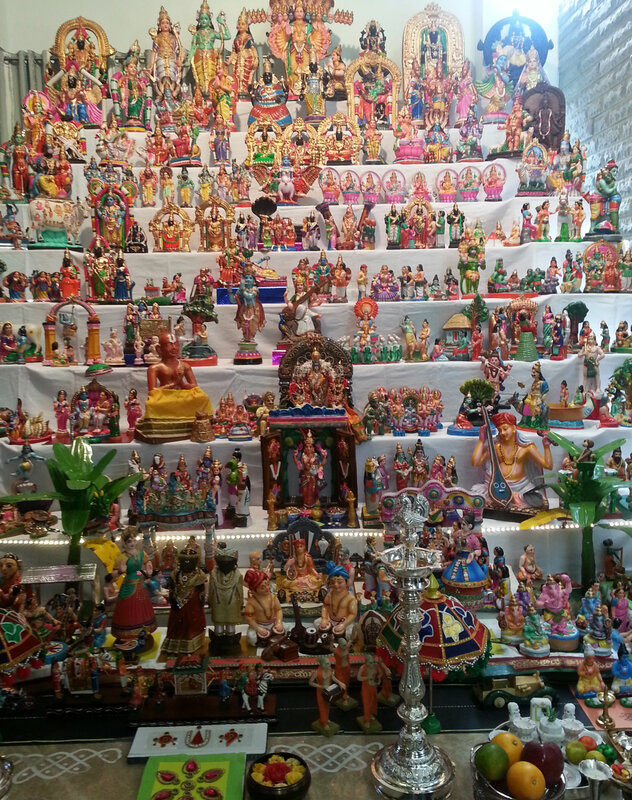 An important tradition of Dasara / Navratri in Karnataka is Bombe Habba or ‘the display of dolls’. 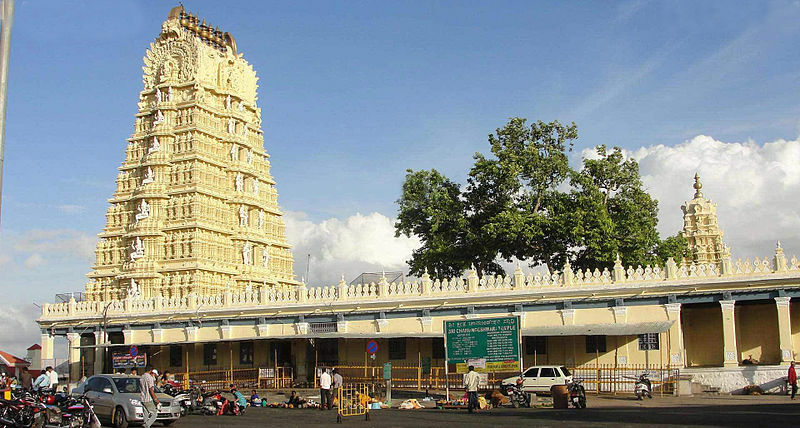 According to legend, when the Gods gave all their powers to Chamundi to go fight Mahishasura, they became powerless and stood still like statues. Once the demon was defeated, people commemorated the actions of the Gods by praying to them in the form of dolls. Many houses display the dolls through Dasara on odd-numbered tiered steps built specifically for this purpose. The most important dolls are the Pattada Gombe which symbolise the King and the Queen. They are always made of dark wood, simply designed and decorated with cloth or paper. On the display steps, Gods are placed high, then saints, kings & queens, next any depictions of festivals & celebrations, and finally, portrayals of everyday life. Women invite each other to come over each evening for prayers and aarti, and having the best dolly display is a matter of pride. While the first few days of Dasara are a little low key, Saraswathi Pooja is celebrated on the 7th/8th day. Goddess Saraswathi is the Goddess of knowledge & arts. It is customary to place books and musical/art related supplies by her idol and pray for her blessings in mastering those skills. 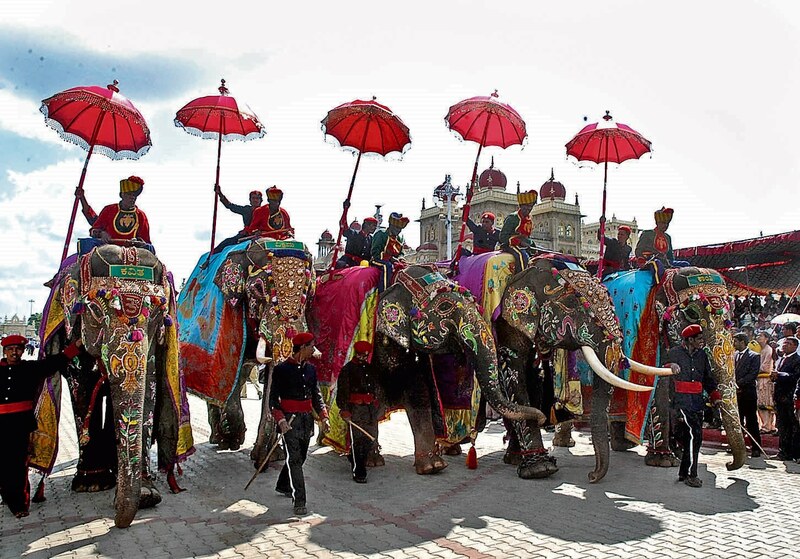 On Vijayadashmi, the 10th day celebration, the main attraction is the Jamboo Savari (Elephant Parade). One of the many brightly decorated royal elephants is mounted with a 750-kilogram gold mantapa (altar) carrying the idol of Goddess Chamundeshwari. After the King & Queen offer their prayers at the palace, the colorful and loud parade moves through the city. Tens of thousands of people line the streets and buildings to watch these regal elephants, horses, camels, musicians, members of the armed services, dancers, acrobats, school children and more march & perform along the way. I have spent many years as a young girl sitting on the sidewalk with relatives, waiting with bated breath for the procession to go by, and can’t wait for a time when I will be able to do it again. Above, performers of traditional art forms of Karnataka participate in the procession. 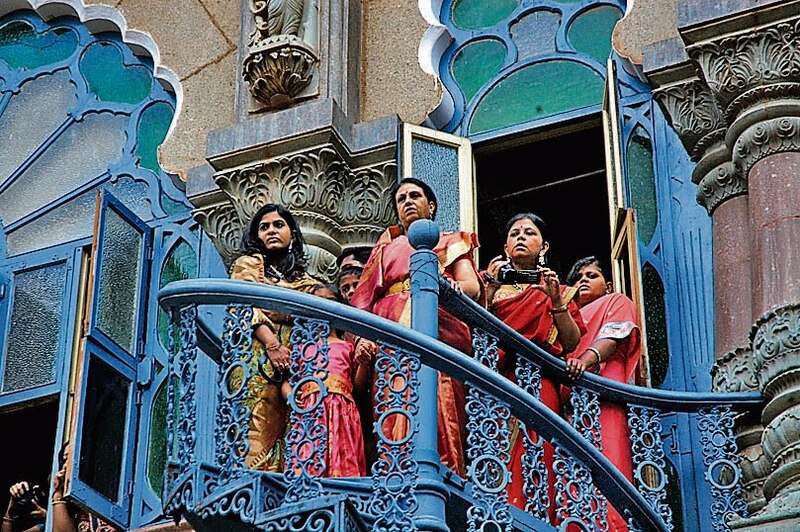 Below, the current Maharani Pramoda Devi of Mysore (center, in pink) and her family watch the festivities from a palace balcony. 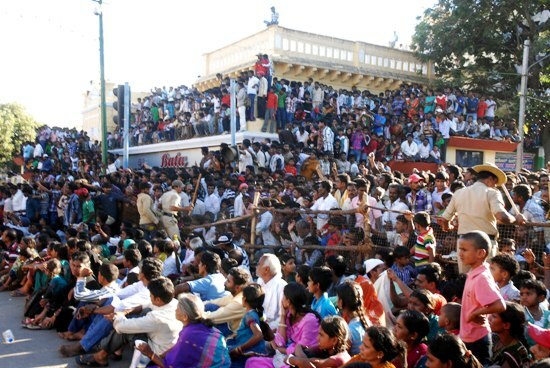 The procession ends at Banni Mantapa Grounds – the site of the sacred Banni tree. Legend has it that Arjuna retrieved his weapons that he had hidden in a hole in this Banni tree before being banished to exile for 14 years. The Pandavas then defeated the Kauravas in the Kurukshetra battle, and returned victorious on Vijayadashmi. Hence, the festival of Ayudha Puja (worshipping of weapons) is celebrated on the 9th day. 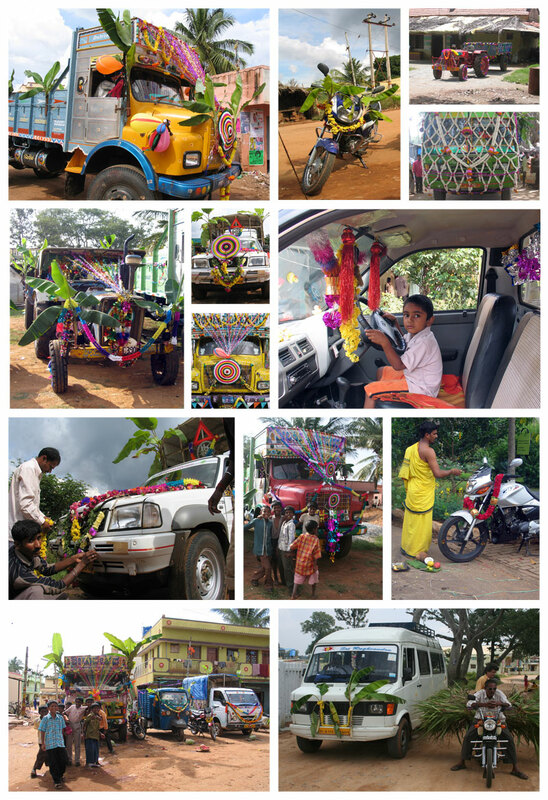 Current day interpretation has made the festival one where all vehicles and tools are cleaned, decorated, and prayed to for safe and productive usage. Limes are placed under each wheel of the vehicles as sacrifice, and we drive/ride over it till it is squashed. 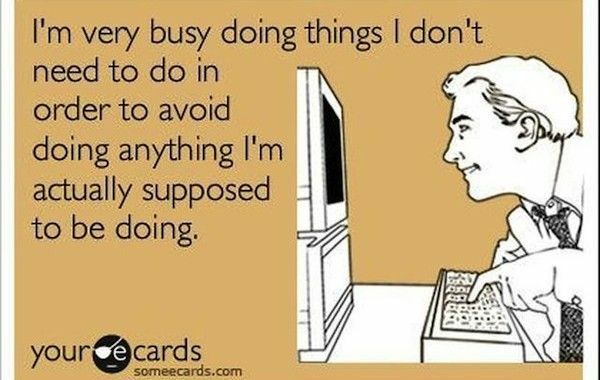 It is not uncommon for businesses to shut down their computers and machinery so that they can be cleaned and prayed to. I remember washing and decorating my bicycle with flowers and balloons when I was a little girl and being so proud of my handiwork. It is unfortunate that on December 10, 2013, Mysore Maharaja Srikanta Datta Narasimharaja Wadiyar passed away at the age of 60. 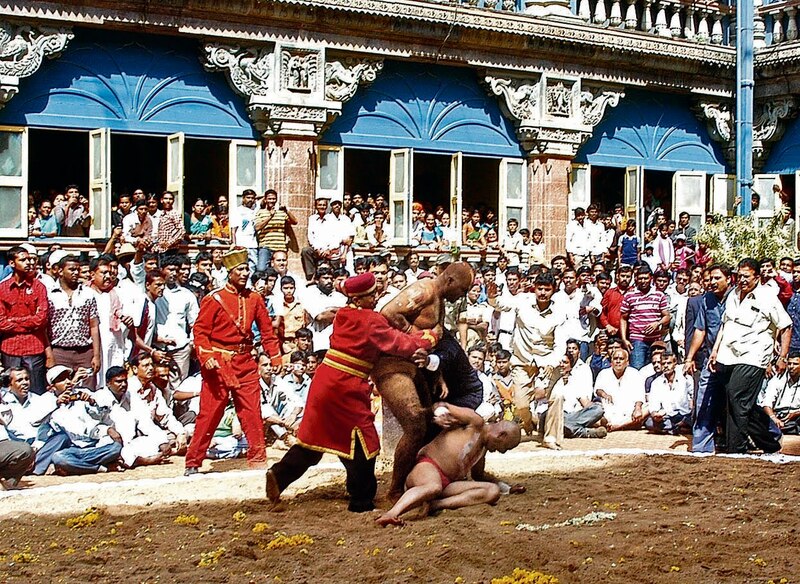 For the first time in hundreds of years, Dasara festivities will be held without a king. 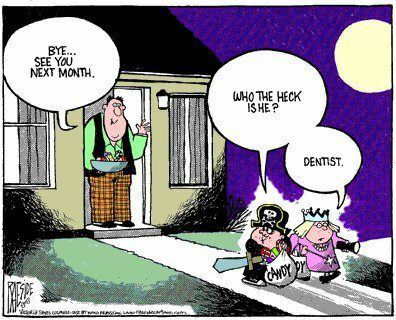 Hello to HolyKhao readers. 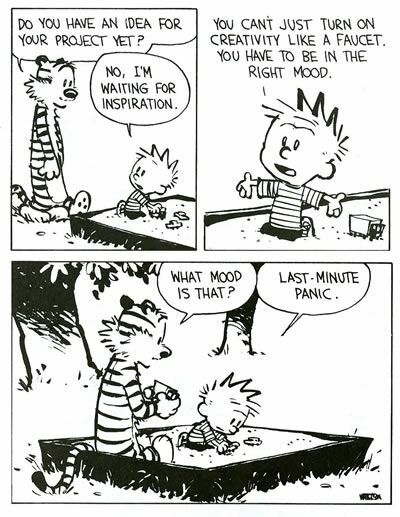 Hope all’s well and you’ve all had a wonderful summer. I’ve been gone a long time, and haven’t posted anything the last few months. Summer break was super busy but interesting – some traveling, family visits, hungry kids, play dates, sleep overs, pool time, and most importantly – a new addition to the family! 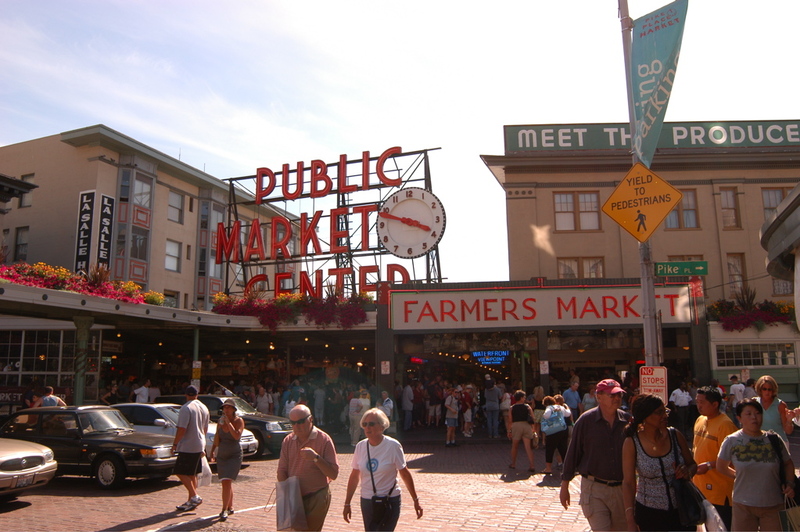 We were able to get away for a short visit to see my good friends in Seattle and I think I am in love with the city. Catching up with a good friend over cups of tea, eating out, hanging out with the kids, visiting sights – thanks to our wonderful hosts A&S. The spectacular views of Mt. Rainier from the city, the farmer’s markets, Pike Place, the scenic walking trails, wild berries on the side of every road just waiting to be picked and eaten, Hurricane Ridge, and ferry rides to Victoria to see the beautiful Butchart Gardens were some of the highlights of the trip. We visited Mt. 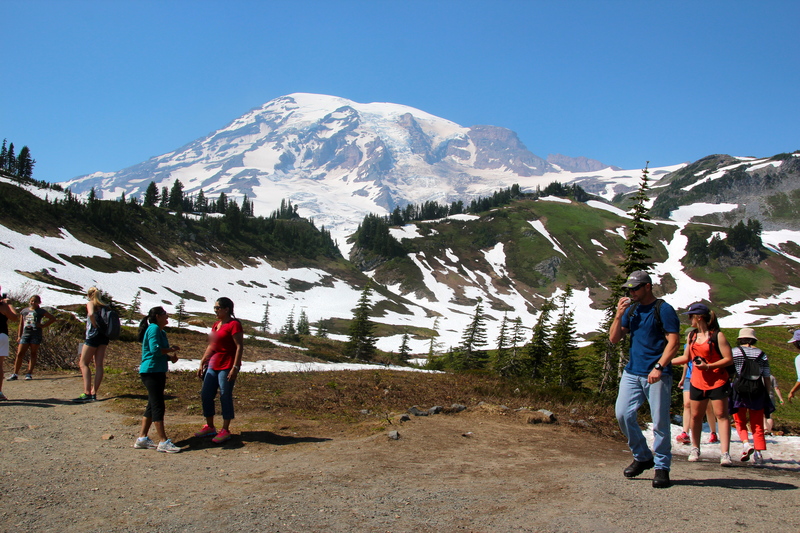 Rainier from the Paradise area, and enjoyed walking on snow in gorgeous mid-70s weather :). 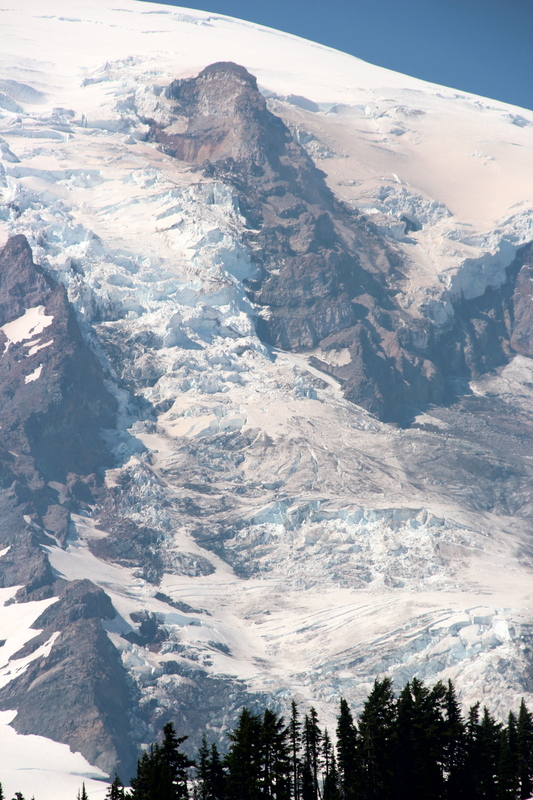 The picture above is of Paradise Glacier. For size perspective, we were told that the snow is hundreds of feet deep in some of the spots in this photo. 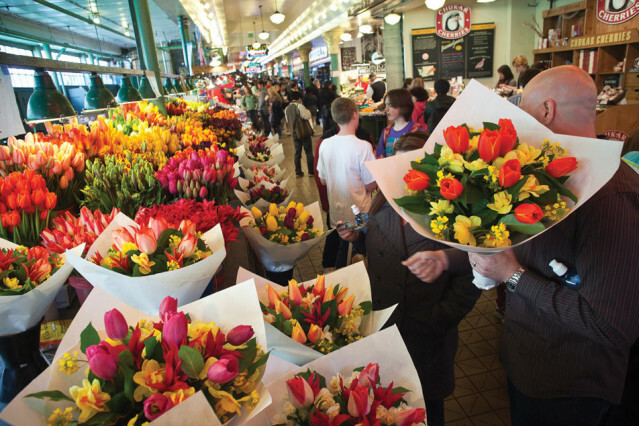 Pike Place is Seattle’s original Farmer’s Market, established in 1907 – nine acres of local, artisanal & speciality food and crafts. Absolute must visit if you are in Seattle. 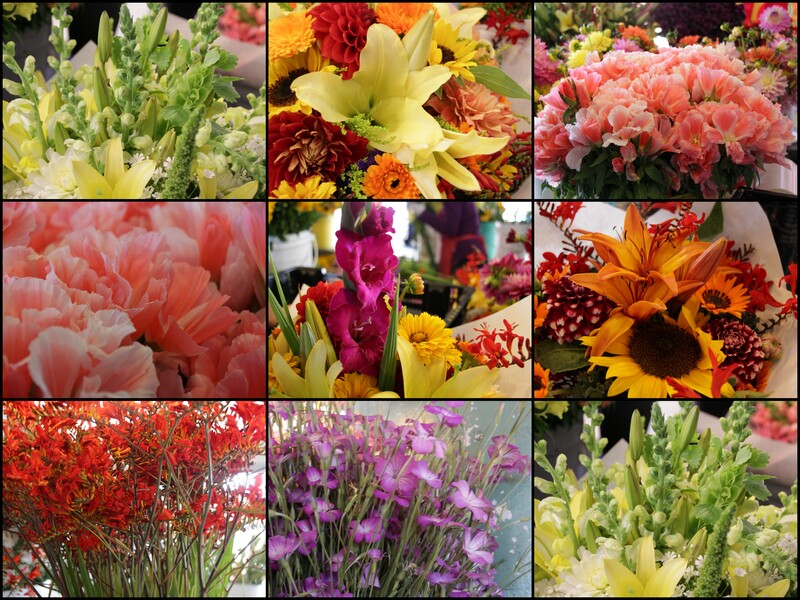 The pictures below are of the many varieties of flowers for sale – bouquets were as cheap as $5 for a big bunch!! 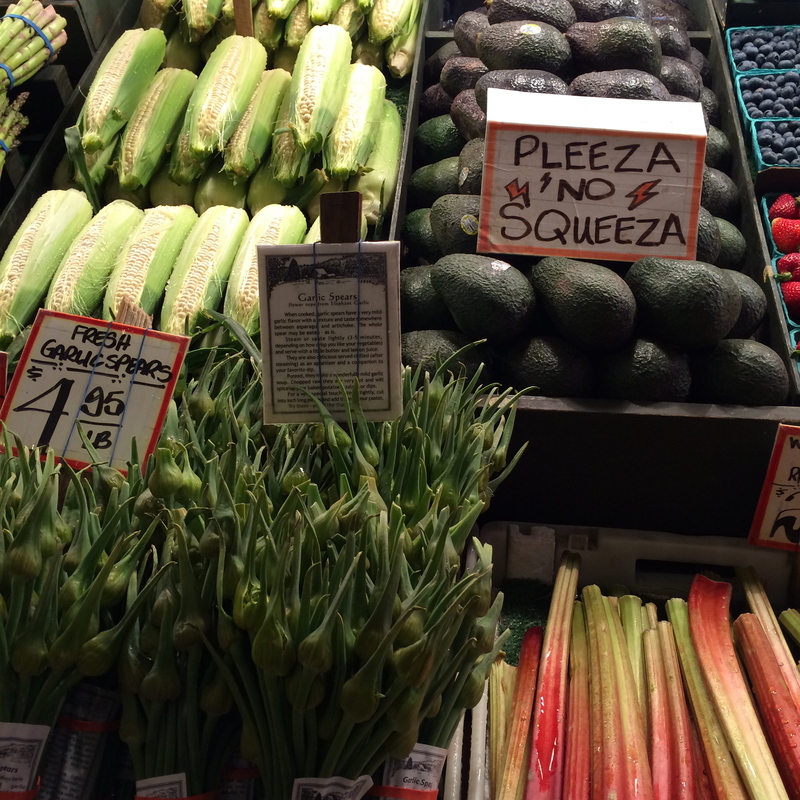 Fresh, local vegetables at Pike Place Farmer’s Market. 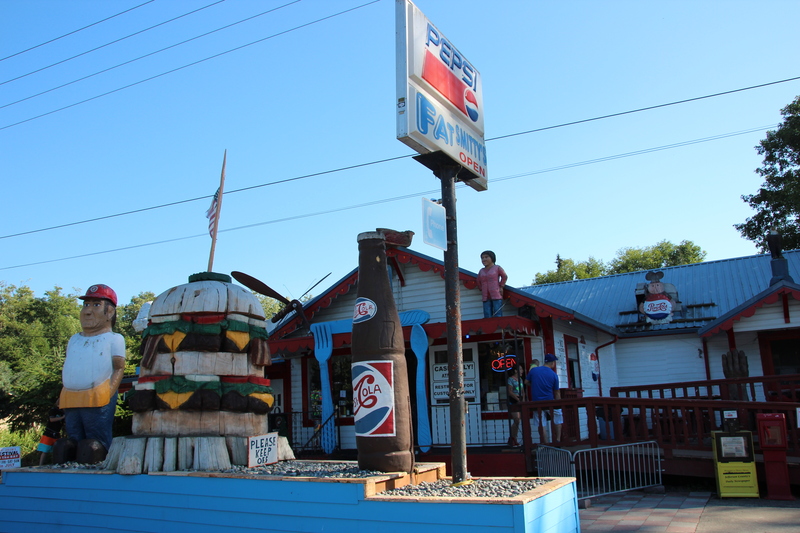 On our way to Victoria, BC, we stopped at Fat Smitty’s for milkshakes & fish n’ chips. 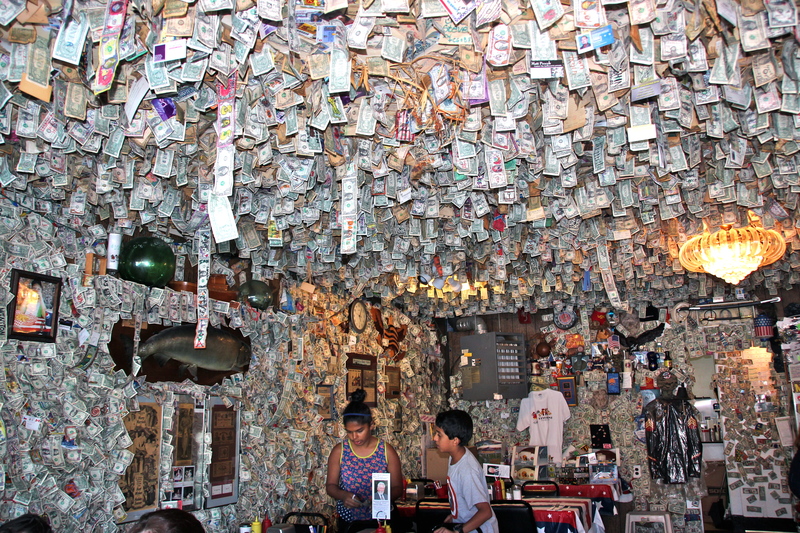 Customers tack dollar bills to the walls and ceilings as donation, and it is taken down when full with the help of local Boy Scouts, and donated to charitable causes. 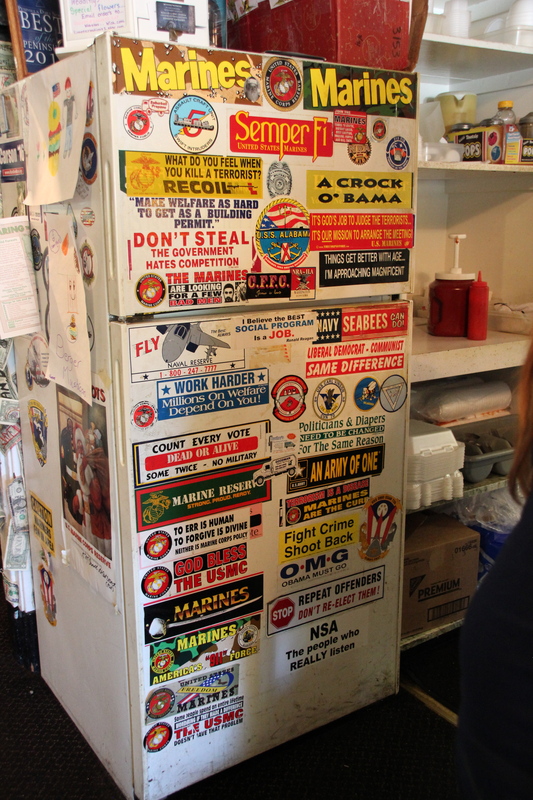 If you get bored while you wait, you can read what’s written on the prominently placed refrigerator!!! 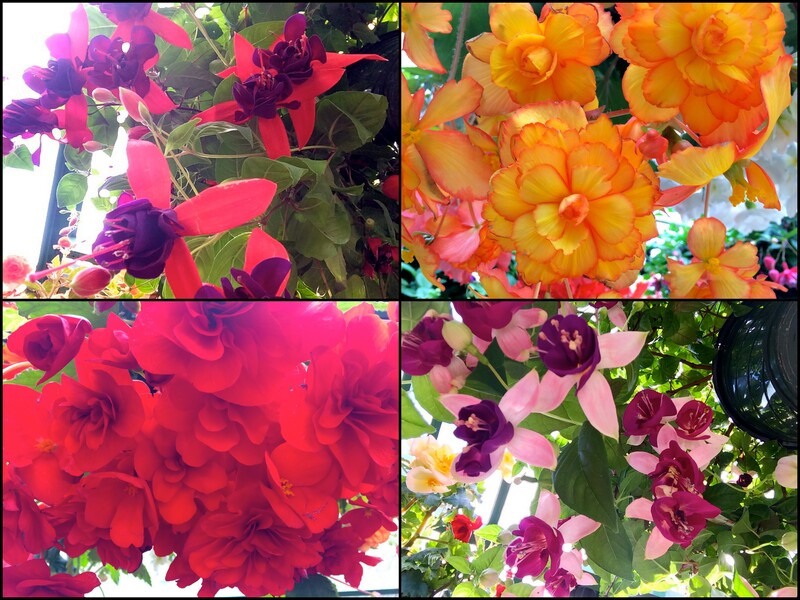 Below is a small glimpse of beautiful Butchart Gardens – it’s story is simply amazing. 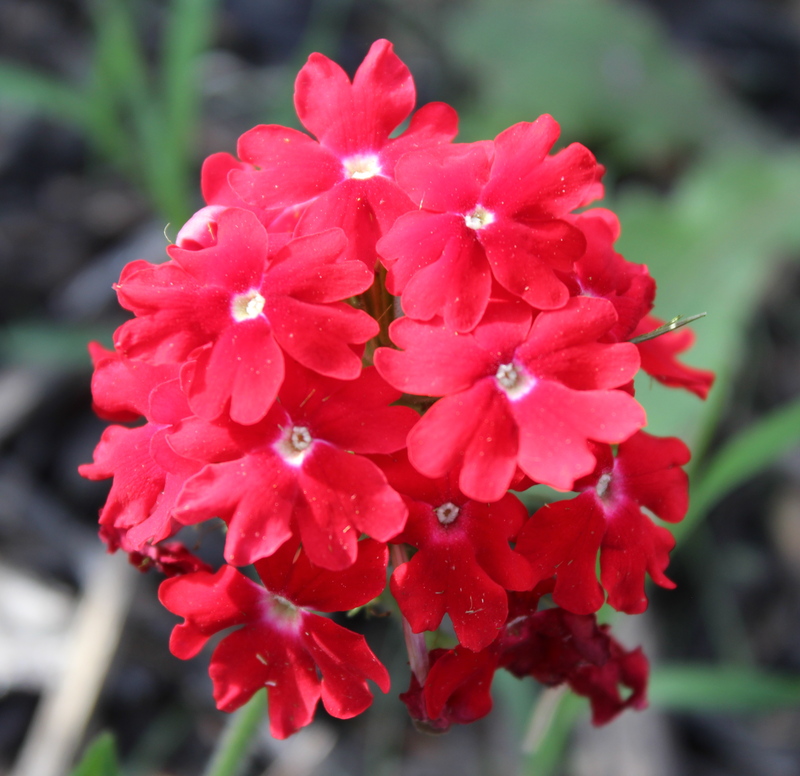 Today, hundreds of varieties of plants bloom in dozens of different gardens on the grounds that were once mined for limestone to supply cement. 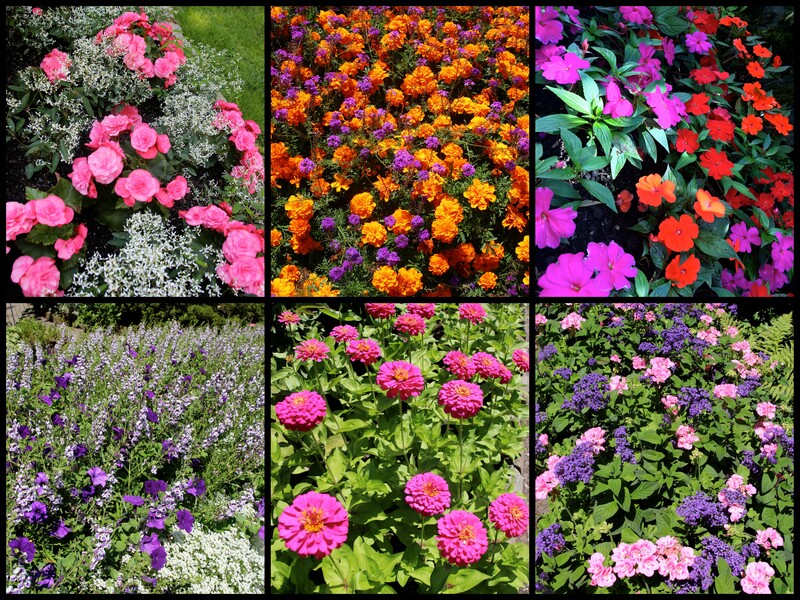 The pictures above are of flowers in huge hanging baskets above our head. 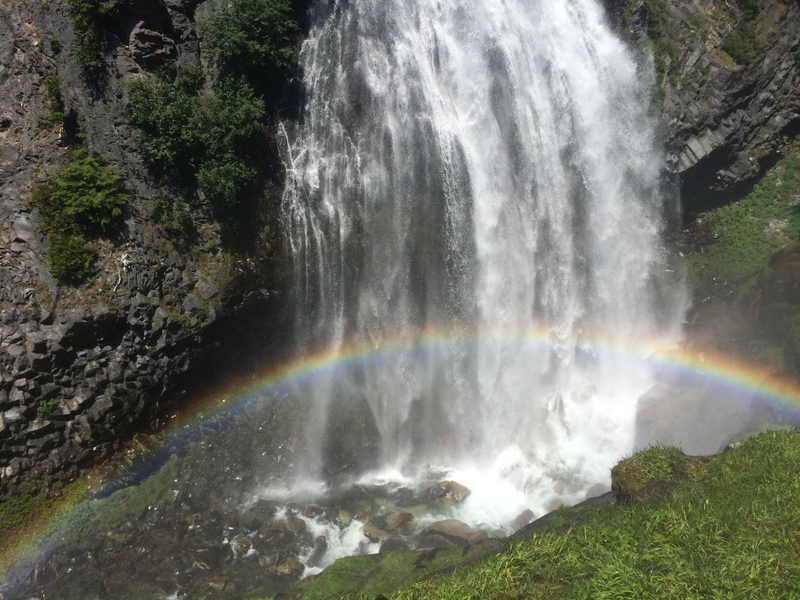 Of course, we did visit the Seattle Space Needle, the original Starbucks, Snowqualmie Falls, Pine Lake Park, and many other sites. 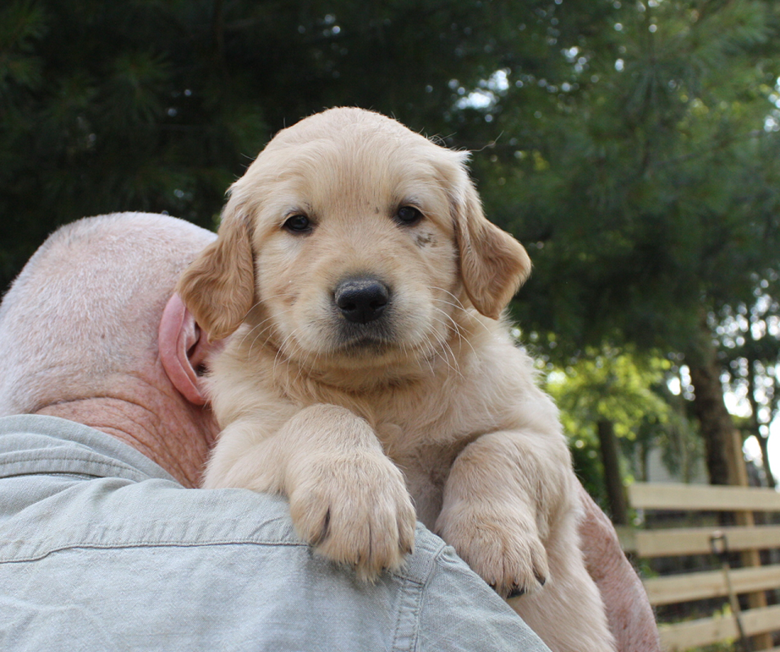 We arrived back home from a wonderful trip, and two days later brought home 7-week-old Snuffles. 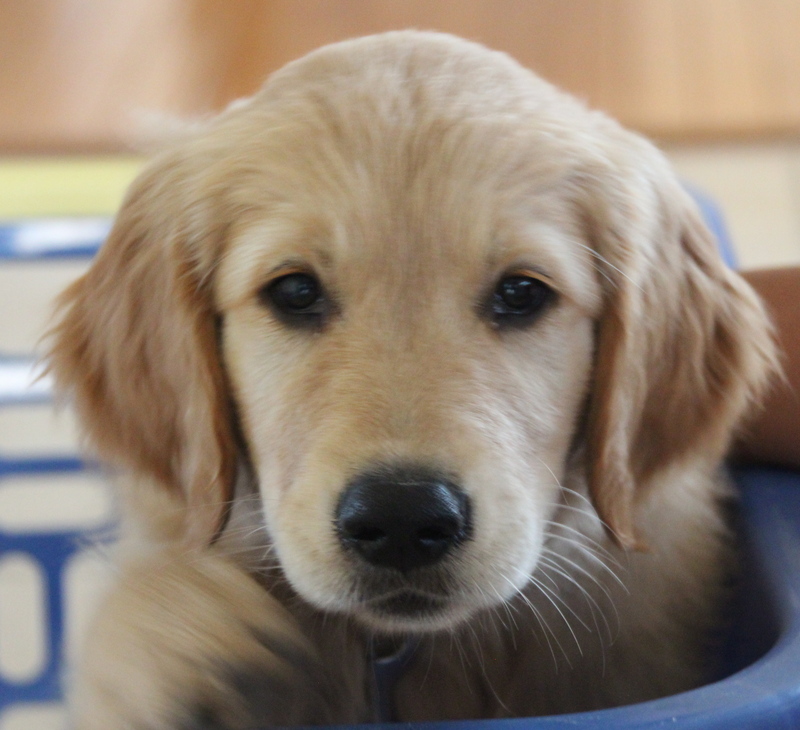 He turned 14 weeks on the 5th of September, 2014. This little puppy has been gaining 10 lbs every 3 weeks!! The last 8 weeks have been so much fun, but has revolved around Snuffles’ eating, sleeping, walking, pooping schedule. It’s like having a baby all over again! With the kids finally back in school, I have had some sort of routine and am back to blogging. 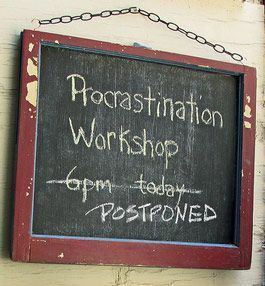 I will be posting some healthy and fun recipes soon. Enjoy the last few warm days before winter sets in. Is it true that the whole country is going to get slammed with a wet and snowy winter again? 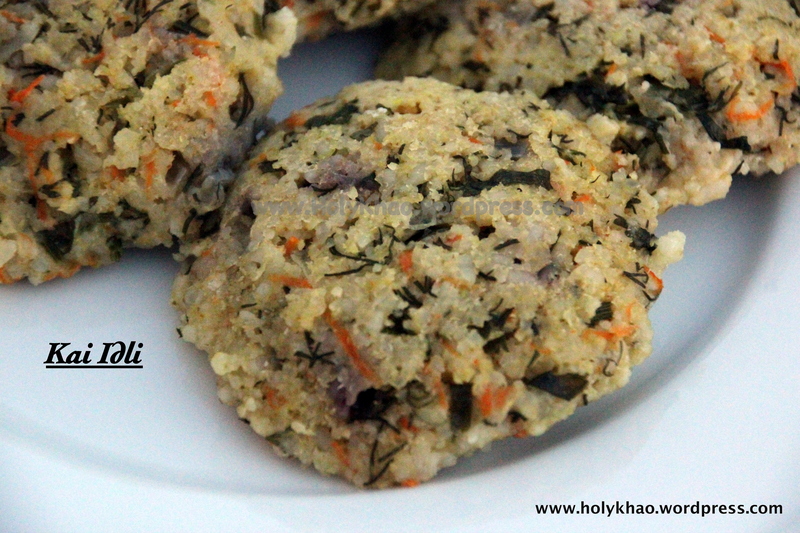 HolyKhao wishes all you wonderful moms a HAPPY MOTHER”S DAY. If you want to read some interesting facts about how this celebration started, go to http://time.com/95051/mothers-day-dark-history/.